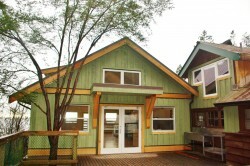 Skeena Lodge is the largest of the rental lodges and has recently gone through an upgrade. It has a maximum capacity of 100 people. Skeena Lodge includes a large common room (the Gosse Lounge), a separate brand new dining room, a large fully-equipped kitchen with a 6 burner stove, grill, two ovens, convection oven, two large upright coolers, upright freezer, cookware, cooking utensils, dishes, cutlery, and a dishwasher – we supply the dishwasher detergent. Skeena Lodge also has five washrooms in the building, four of which have a shower. Skeena Lodge has 39 beds (bunks) – one 16-bed dorm, one 12-bed dorm, one 6-bed dorm, and three small rooms off the porch with a total of 5 beds. Skeena Lodge has a very large deck that provides an amazing view overlooking Georgia Straight. Near Skeena Lodge there are 14 sleeping hulls, each of which sleeps 6 people on beds with mattresses. Adjacent to the sleeping hulls is a washroom building (KYBO) with flush toilets, sinks and showers. Near Skeena Lodge there is a good-sized designated campfire circle with a small platform for skits, etc. 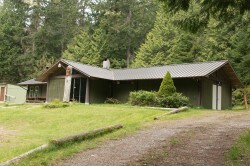 Haida Lodge is a mid-sized rental lodge. It holds up to 80 people in the lodge building (fire marshal limit). Haida Lodge includes a large common room that also serves as the dining room; a smaller lounge; a fully-equipped kitchen with a 4 burner stove, grill, two ovens, a large upright cooler, a chest freezer, cookware, cooking utensils, dishes, cutlery, and a dishwasher – we supply the dishwasher detergent. Haida Lodge has two washrooms in the building, equipped with a shower. 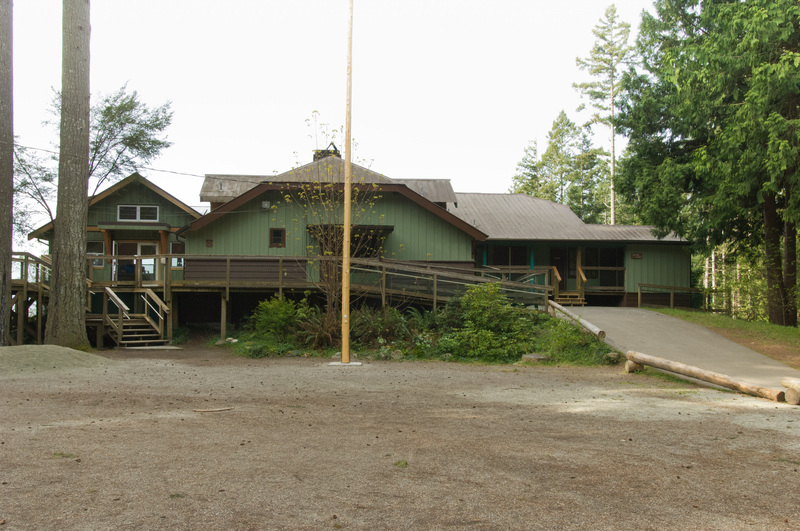 Haida Lodge has 16 beds inside the lodge building – two 8-bed dorms (bunks). Near Haida Lodge there are 12 sleeping hulls, each of which sleeps 6 people on beds with mattresses. 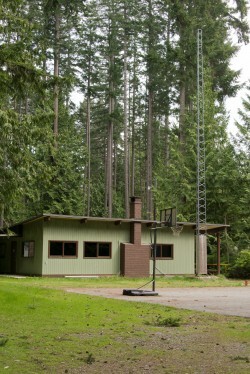 Salish Lodge is a mid-sized rental lodge. It can accommodate up to 70 people (fire marshal limit). Salish Lodge includes a large common room that also serves as the dining room, a smaller lounge, a fully-equipped kitchen with a 6 burner stove, grill, two ovens, a large upright cooler, a chest freezer, cookware, cooking utensils, dishes, cutlery, and a dishwasher – we supply the dishwasher detergent. Salish Lodge has two washrooms in the building, equipped with a shower. 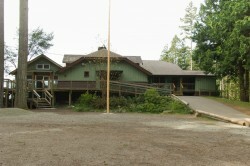 Salish Lodge has 16 beds inside the lodge building – two 8-bed dorms (bunks). Near Salish Lodge there are 10 sleeping hulls, each of which sleeps 6 people. 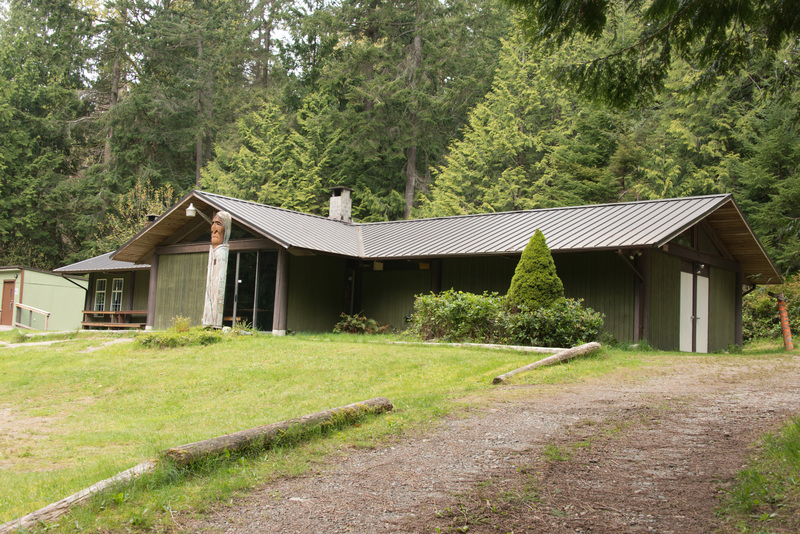 Please note that the Salish Lodge sleeping hulls are bare floors – there are no beds or mattresses supplied. 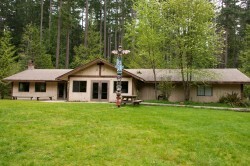 Salish Lodge has a designated campfire circle. Rotary Lodge is the smallest of the rental lodges. It has the capacity to accommodate 50 people in the building (fire marshal limit). Rotary Lodge includes a large common room that also serves as the dining room; a fully-equipped kitchen with a 6 burner stove, grill, two ovens, a large upright cooler, a chest freezer, cookware, utensils, dishes, cutlery. Rotary Lodge has two washrooms in the building, equipped with a shower. Rotary Lodge contains 9 beds inside the lodge building – 3 in one room and 6 in the other. Near Rotary Lodge there are 6 sleeping hulls. Each hull sleeps 6 people. Note that the Rotary Lodge sleeping hulls are bare floors – there are no beds or mattresses supplied. Rotary Lodge maintains a designated campfire circle.